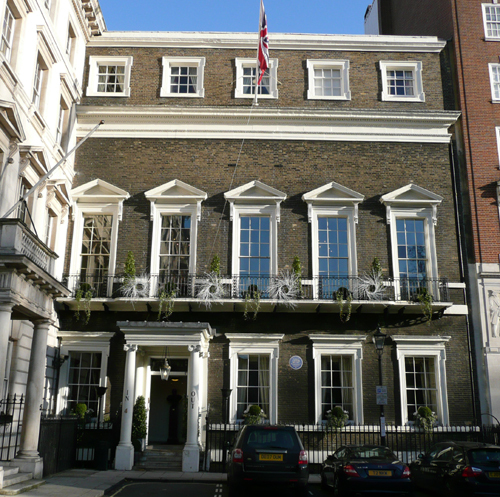 No 4 St James’s Square, the building currently occupied by The Naval & Military Club was designed by Edward Shepherd and erected between 1726-28. I was twice asked for advice by architects acting on behalf of potential purchasers of the lease. If a 2cm x 3cm fragment of paint weighed 3.6gm and if the dimensions of the ceiling are 6.5m x 8m (520,000cm2) this means that the total weight of paint on the ceiling was approximately 312kg! On the underside of the paint were the remains of a glue-size primer. It was hardly surprising that the paint had begun to fall. It is not known if my advice was taken or if paint is still falling from the ceiling. As with so many of my jobs there was a relationship between this and another – the Club’s previous premises – Egremont House.